And the last two Flinters were sold at auction. IMO 9361330 Norrfury (ex Flinterfury) renamed Pagadder and changed to Belgium flag. Cargo ship "Kota Matadi" (IMO 9371933) renamed yesterday, here in Lisbon, "MCP Nicosia"
General cargo SUSANNE, ex-GEULBORG, IMO 9100140 renamed FIRDEVS when sold to Turkish buyers in late May 2017. Shagangfirst Power (IMO: 9520716) recently renamed into ESL Dolphin. LOG-IN Amazonia (IMO 9348998) has been renamed HAIAN FAIR at Rio de Janeiro, Brazil last sunday (June 11th). Unibaltic tanker Ametysth (8820286) was sold and renamed to Hordafor VI. Iver Example 9314208 Dutch now HYDE Marshall Isl. But I'm afraid that some corrections are needed. IMO number for ASKOE should be 9333450. There has not been a Dutch Antilles flag since that area was dissolved in October 2010. The flag has been Curacao since then. 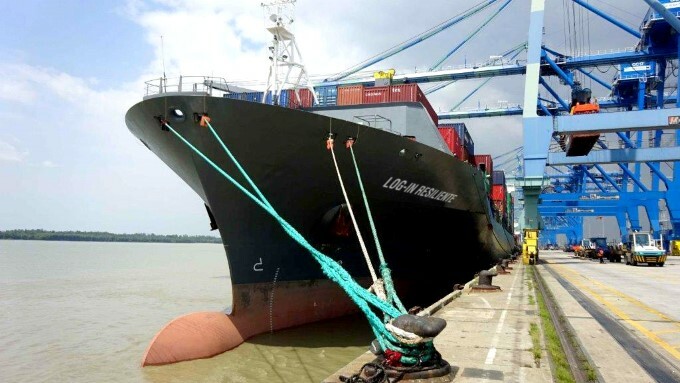 Vessel AROSIA (IMO 9327669) has been renamed LOG-IN RESILIENTE as she was sold to the brazilian company Log-In Logística Intermodal SA. I believe the paintjob was done when the vessel was still in Durban (South Africa), which was her last port of call. She's currently anchored off Salvador (Brazil) and the following picture was released by brazilian medias but I think it was taken somewhere else. If anyone can confirm.